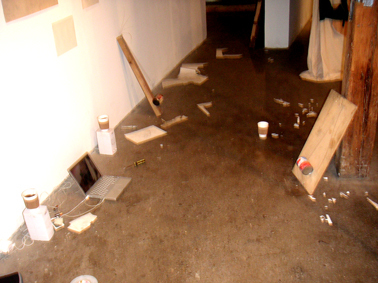 The laptop computer was hooked up to the speakers by the western wall and the Elsewhere Right Now concert was played through them. 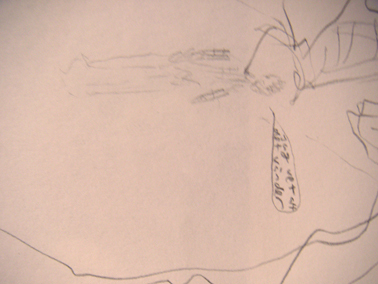 On the screen could be seen a slideshow of photographs from the concert. 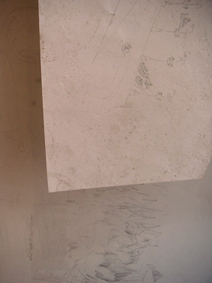 The drawing of the interior of a room was removed from the outer eastern wall, where it had been placed underneath one of the "echo"-graffiti photographs, and instead placed on the western wall, to the left of the drawing of some figures in a bar. 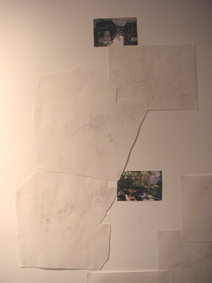 Another, newly made, cut-out drawing of a house with some figures in a kitchen and an outdoors patio covered with grapevines was placed above the previous cut-out drawing on the same theme. 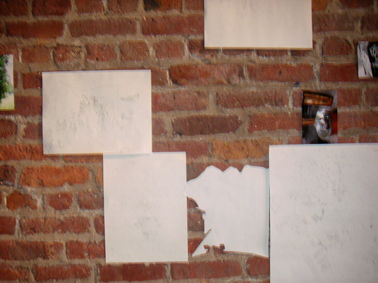 Added to this cluster of drawings (and placed above the photograph of the grapevine-covered patio) was another one depicting a figure with a word-balloon containing the text "Jag vet att det vänder", surrounded by a large mass of jagged lines. 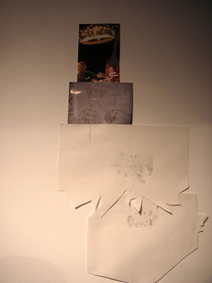 A drawing of a head and some angular lines, which had been laying on the floor by the western wall (where it had been covered by coffeegrinds and stepped on), was placed on the wall above the photograph of the tour-bus with the pirate-flags outside the Boredoms/Lightning Bolt show. 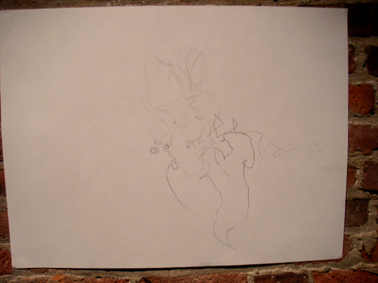 The drawings of a figure in the subway (with word balloons saying "And if a ten-ton truck kills the both of us, to die by your side well the pleasure, the privelidge is mine, there is a light that never goes out") and of a Quiz-night at a bar were removed. 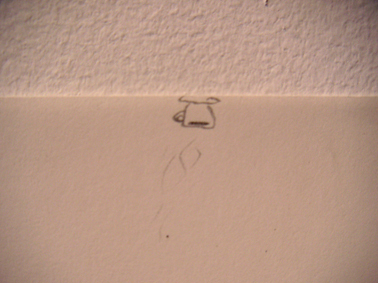 The drawing of a figure laying in a couch listening to a stereo (with the head of Morrissey floating above it) was moved to a position right beneath the drawing of a vaguely sketeched head and a coffee-cup. 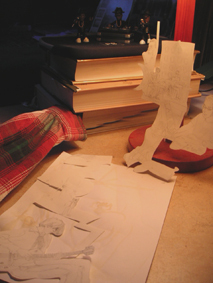 A photograph depicting some cut-out drawings of the band Elsewhere Right Now placed among a pile of books, a flannel shirt and toy-figurines of the band RUN D.M.C., was attached to the wall right above the laptop computer. 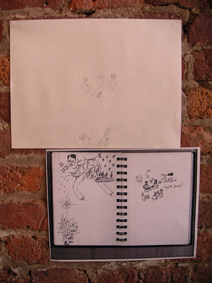 Two photographs were placed above the cluster of drawings depicting a band playing the songs "Riot at McDonald's" and "State of the Union". 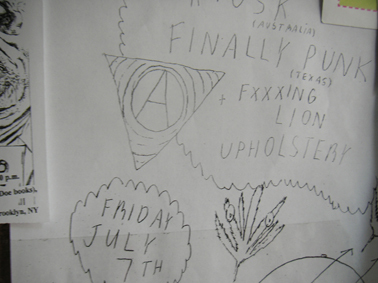 The first photograph was the one of a flyer bearing an anarchy sign and the text "Finally Punk" (which previously had been laying on the floor by the inner eastern wall). 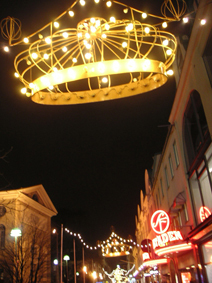 The other photograph was of a large christmas decoration, a light-studded crown, hanging above a street. 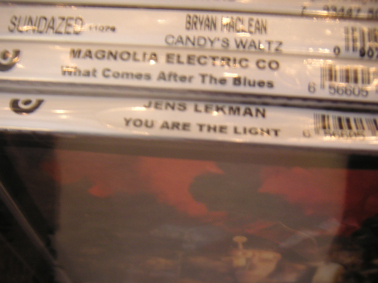 A photograph of the CD-spine of the Jens Lekman record "You are the Light" was hung underneath the drawing of some people in a bar. 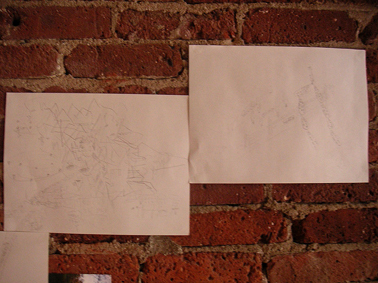 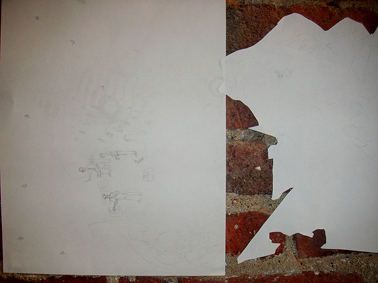 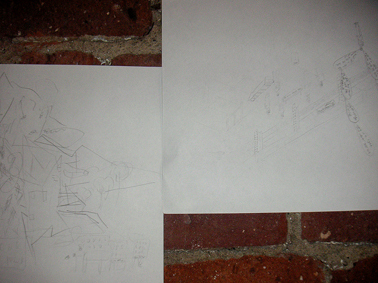 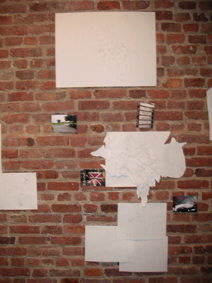 A cut-out, fairly abstract drawing was placed above the drawing of two figures at a Virgin Mary shrine placed on the eastern wall (by the cut-out drawing of a rehearsal space). 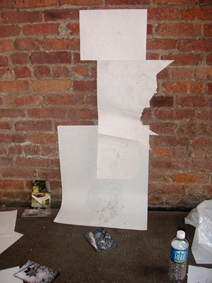 A photograph of a t-shirt with a DK-logo (representing the punk band Dead Kennedys) was placed on the left-hand side of the cut-out drawing. 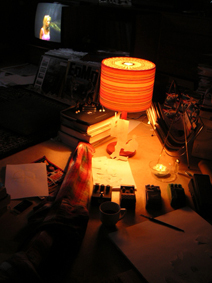 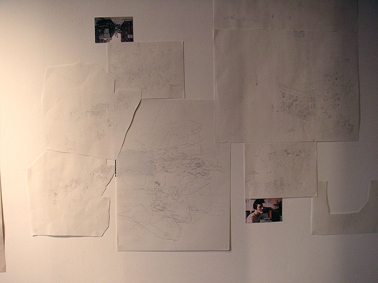 Another photograph, of the interior of a room with guitar-effect pedals, drawings, a lamp and a TV, was placed on the wall between the drawing of a group of people in an apartment and the cut-out drawing of a rehearsal space. 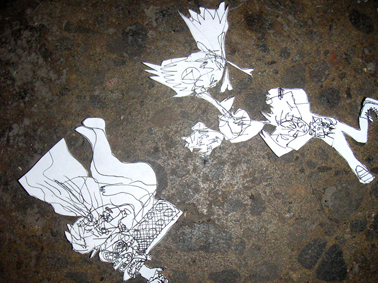 On the eastern wall in the outer gallery a cut-out drawing, which had been laying on the floor (also having been covered by coffeegrinds and stepped on), was attached to the wall between the drawing of some figures and buildings in a forest-like landscape with the band Sonic Youth in the sky, and the drawing of four figures outside of a cafe, with a sleeping figure in the sky. 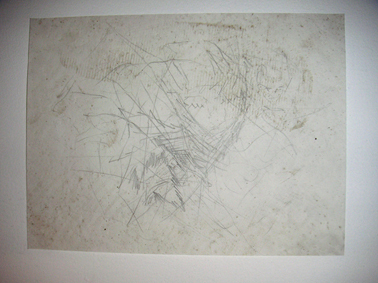 The drawing of a figure in a subway was placed on the right-hand side of the drawing of some heads and figures in a landscape of jagged lines, buildings, tram/subway-lines and thundering clouds. 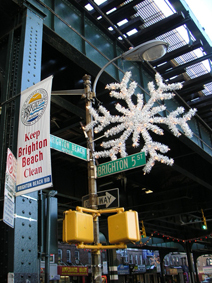 A photograph of a large snowflake-like christmas-decoration hanging next to street signs reading "Brighton Beach Avenue" was placed above this cluster of drawings. 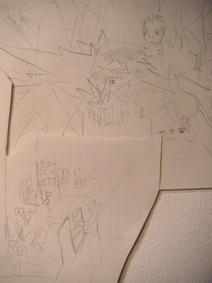 A drawing of two figures sitting on a stoop outside of an apartment building was placed above the drawing of two figures in an apartment with Moomin-troll figures outside of it. 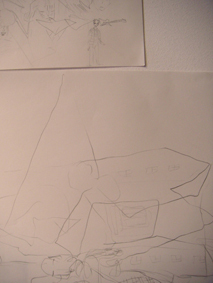 To the left of the cut-out drawing of a figure in a vaguely sketched landscape, and right below the drawing of the band Kartoffel Menschen Trio performing the song "Disco Chaos", a drawing of the band Pole Position, rehearsing on the moon, was placed. 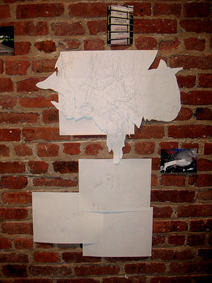 A drawing was attached to the lower part of the wall, right above the photographs of a combined peace and anarchy sign done in coffeegrinds and a building made out of lego. 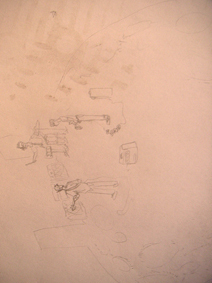 The drawing depicted three young persons talking, below which were a second group of three figures sitting on the steps of a building, word-balloons reading "Pixies Clash", "Guns 'N' Roses", "Du är en punkare!" 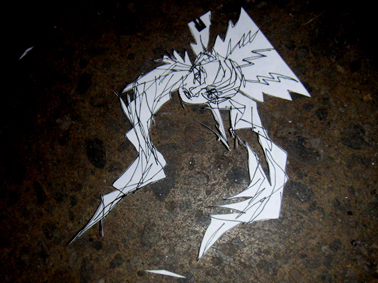 and "You are a punk!" 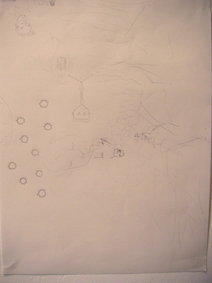 surrounding them. 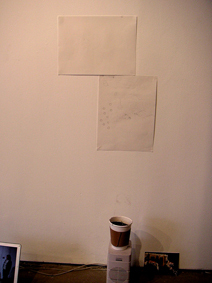 Below this drawing a photocopy of a sketchbook page was placed. 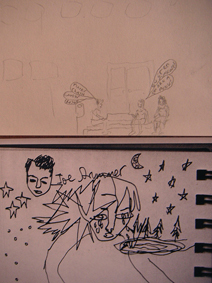 Upon this could be seen two heads by a lake with stars above, the text "Joe Strummer" and a star, below which could be seen a figure listening to a stereo with headspeakers. 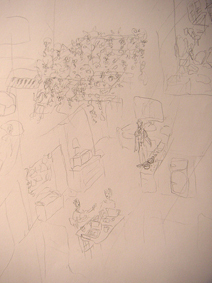 To the right of these a group of five figures could be seen sitting, one of them with an acoustic guitar. 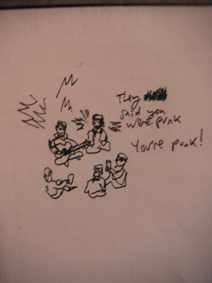 The text "They said you were punk You're punk!" 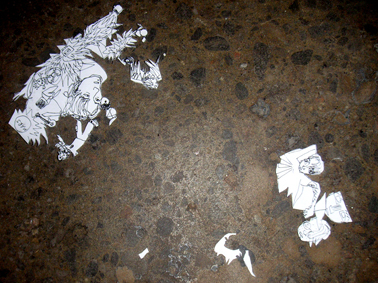 could be read next to the figures. 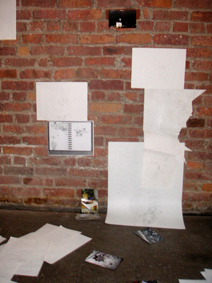 Drawings were cut out of the photocopied sketchbook-pages and scattered around the floor of the gallery.